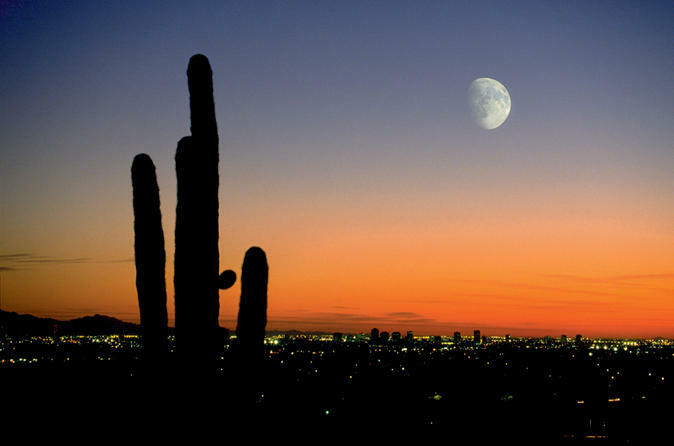 Surrounded by mountain ranges, the desert metropolis of Phoenix is a truly stunning sight at sunset, when the city lights start twinkling as the sky goes dark, highlighting the contrast between rugged Arizona mountains and urban splendor. Take an approximate 45-minute flight over Phoenix in either a fixed-wing Cessna Caravan or a Cessna T207 to experience this amazing sight. These high-winged airplanes are perfect for flightseeing and picture-taking! See the Phoenix valley from an incredible point of view, as the sun sets behind the mountains and the city starts lighting up, creating a beautiful desert glow. Your 45-minute tour of Phoenix at sunset will give you a cardinal's-eye view of well-known Phoenix-area sites like the University of Phoenix Stadium. Unlike any other in North America, the stadium – home to the Fiesta Bowl and the Arizona Cardinals NFL team – is a marvel of design, engineering and technology with a retractable roof and field. You’ll also fly over the Phoenix International Raceway, soar around the South Mountains and then head back north across Sky Harbor. See where pro sports teams like the Phoenix Suns and Arizona Diamondbacks play. Fly above Symphony Hall, the Arizona Science Center, the Phoenix Art Museum and more. You'll head up the central valley before landing back at Deer Valley. Aircraft used are Cessna Caravans and T207's. These high winged airplanes are perfect for flightseeing and picture taking. Every passenger has a window seat for unobstructed views of the spectacular sights below. The listed price does not include a USD20 per person fuel surcharge, payable at the time of tour check-in. The fuel surcharge is required by our local supplier and is not within our control. A private tour surcharge may apply, please see Additional Info for full details. Hotel pickup is available for this tour for an additional fee. Fees are determined based on the location of your hotel (USD35 to USD50). This service can be scheduled with the supplier directly, contact details will be provided on your pre-paid voucher which will be received after booking.